If DistribuTECH 2015 drove home a single message, it’s that times are changing for the power sector. Jeff Martin, CEO of San Diego Gas & Electric, believes there will be more change in the utility industry over the next 10 years than in the last 100 years. But what does change mean for different utilities? And how fast will it happen? Will it be incremental? Or will it be disruptive? "We don't want to be a denier of change"
SCE's strategy is to focus on optimizing its core wires business. The utility invests $4 billion to $4.5 billion each year, 95 percent of which is focused on the wire system, said Craver. At the the same time, SCE sees itself as a facilitator of distributed energy resources. Late last year, the utility announced contract winners for its Local Capacity Requirement RFO, a long-term plan to bring about 2,200 megawatts of distributed resources on-line by 2022, including 250 megawatts of energy storage that could set a precedent for incorporating distributed and customer-owned energy assets into the grid. “We are prepared for change, and we don't want to be a denier of the change. Indeed, we think it’s very dangerous to bet against technology,” said Craver. The threat is real. 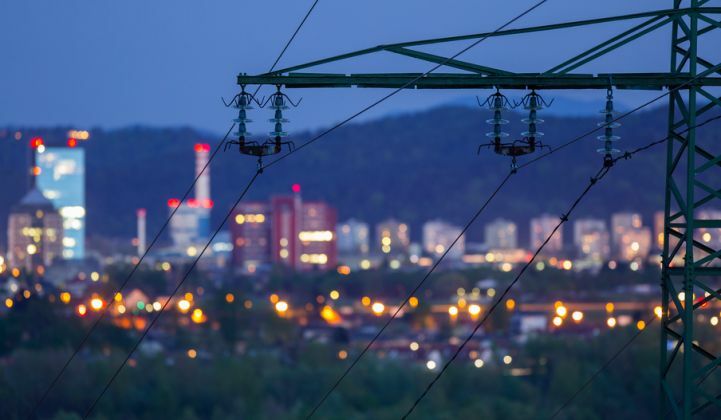 According to new research from Accenture, utilities face $48 billion in revenue losses by 2025 due to customer-sited distributed energy technologies. The same research found that 61 percent of utility executives believe distributed generation will reduce revenues in the next decade, up from 43 percent in 2013. A significant majority of executives also expect increased competition from new market entrants in power electronics hardware and services (73 percent), data-related services (92 percent) demand response (90 percent) and electric-vehicle charging infrastructure (81 percent). But utilities also have the opportunity to offer new services to customers -- things like installing, managing, financing and maintaining solar panels, fuel cells and microgrids. They can also offer energy-efficient home appliance programs and increase the automation and control of consumers' thermostats and boilers for better service. For Duke Energy, entering the realm of customer solutions starts with interoperability. Duke announced last week at DistribuTECH that it’s building a microgrid at its Mount Holly, N.C. test lab to learn how to integrate various electronic devices. The project continues Duke’s work on grid interoperability with a coalition comprising 25 vendors. “In order to enable transformation to take place at the grid edge, your devices have to be able to speak roughly the same languages,” said Jason Handley, director of operations and projects for Duke’s Emerging Technology Office, in an interview. In the medium term, lessons learned from the microgrid pilot could help improve interoperability across the entire grid network, from the control center to the grid edge, thus improving grid reliability and efficiency, and supporting the adoption of distributed energy resources. This research could eventually enable Duke to build, own and operate microgrids for customers -- a business that has traditionally been dominated by third parties. “If you are not prepared for the change, you’re too late,” said James Avery, San Diego Gas & Electric’s senior vice president of power supply, in an interview with Greentech Media at the utility’s Century Park campus. SDG&E has made an effort to get ahead of new technologies and shifting customer demands before they become problems for managing the grid, he said. By the end of this year, the utility expects to achieve California’s 33 percent renewable energy goal for 2020, and that’s not including its 45,000 rooftop solar customers. SDG&E also has a solicitation out for up to 800 megawatts of energy storage and is seeking CPUC approval for a vehicle-to-grid pilot project that would set an hourly time-variant rate to allow for the efficient integration of electric-vehicle charging. Utilities have a natural role to play in the deployment of these distributed energy resources and customer-facing services, said Avery. Of course, how utilities evolve to serve their customers depends heavily on how they’re incentivized. The old kilowatt-hour-based, consumption-driven pricing mechanism may not work in the new world. Many states are working on new rate designs in order to encourage utility investment in distributed generation, while also opening up the market to third-party providers. Digitization has created new ways for utilities to improve operations at the distribution level. For instance, every time a utility sends out a truck to service a house, it costs upward of $1,000, according to DuCharme. Utilities can save millions of dollars by using digital analytics to make operations more efficient. Utilities are facing real challenges from declining load growth. But whatever shiny new product they see on the customer side of the meter, there’s already a faster, nimbler company out there offering it, said DuCharme. The most immediate business proposition for utilities is the "unsexy stuff": predictive analytics, voltage reduction, peak shaving and other operational efficiency improvements. Utilities’ first order of business needs to be to “get your house in order,” said DuCharme. The majority of exhibitors at DistribuTECH (companies like General Electric, AutoGrid, Siemens, IBM and Cisco) were offering IT solutions for better grid management. Solutions like advanced distribution management systems and geographic information systems “give utilities the chance to make better decisions based on efficiency and operational challenges versus going through a rate case,” said Brian Bradford, marketing leader for General Electric’s Digital Energy. While saving utilities millions in the near term, new digital technologies also lay the groundwork for when more solar-equipped, battery-backed, EV-driving, smart-thermostat-enabled customers do enter the market. Utilities are trying to strike a balance between investing in infrastructure to improve reliability and investing in more advanced technologies of the future, said Kevin Dasso, senior director of smart grid for Pacific Gas & Electric, in an interview. "How am I going to make it work?" Richard Wernsing, manager of electric asset strategy at Public Service Electric and Gas Company (PSE&G), New Jersey’s largest regulated utility, had mixed thoughts about the changing utility landscape. The utility has already been actively promoting distributed energy resources. Through its solar programs, PSE&G is making loans for 175.5 megawatts of behind-the-meter solar systems. It’s also building 125 megawatts of grid-connected solar, including 40 megawatts deployed as part of its award-winning pole-attached solar project. These projects have been successful in launching New Jersey’s solar market, said Wernsing. But he’s also realistic about the challenges for continued deployment. There have already been unexplained voltage issues on the distribution grid in southern New Jersey that are believed to stem from solar, he said. “I’m a tech guy. I look at something and think, ‘How am I going to make it work?’ I think my problem with what I see is that the people who look at the benefits [of solar are looking] at the benefits in a silo, and don’t necessarily consider all the costs,” he said. There are similar issues with digital technology. There’s lots of excitement around the possibility for utilities to remotely control energy use in people’s homes, optimizing them for efficiency and the use of solar or energy storage. As appealing as that sounds, however, Wernsing’s takeaway from DistribuTECH was that he needs to get his utility’s billing and operations teams together -- two groups that are often siloed -- to come up with a coordinated strategy on how to manage the data they’re already collecting. Change represents an opportunity, but it also comes with risk, said Wernsing. If change happens too quickly without the proper technical, administrative and regulatory groundwork, it could create a lot of problems for the grid -- and possibly ratepayers. “I’m concerned we’re going to find out later that we wish we would have done it differently,” he said.